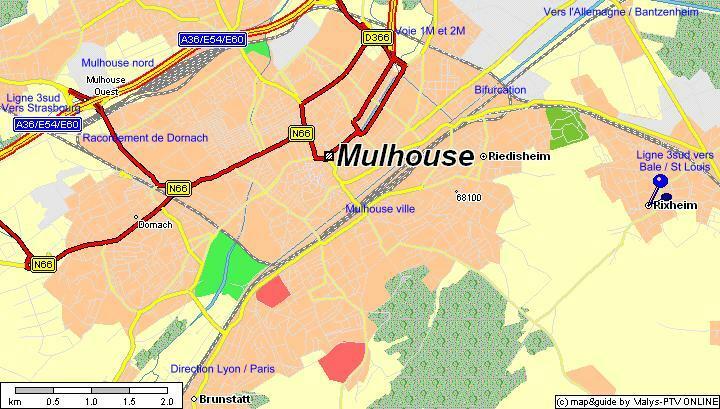 If you are in Mulhouse , you can reach Paris by train in less than 3 hours. A perfect routing would be to fly into Basel, spend at least 3 days to explore the region with expert advise from Swiss specialists at www.namastetourism.com and then go up north to region of Alsace in France and explore Mulhouse, Colmar as well as Strasbourg before heading to Paris for your international flight back to your destination. After my Swiss sojourn in Zurich and Basel, it was time to say Bonjour and I was well received by Clemence from Mulhouse Tourism to this lovely town of Southern Alsace very close to the wine route and truly a city of many cultural treasures. 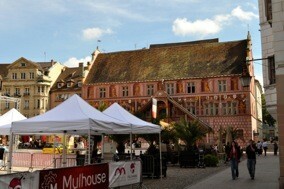 We started walking from the Mulhouse train station in the direction of Place de la Reunion with its medieval houses and colourful façades, the Renaissance styled Town Hall, the protestant church of Saint Etienne with its 14th Century stained glass windows and a city which has some of the most amazing museums. 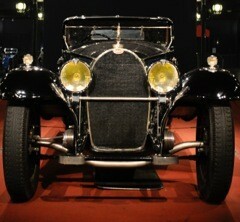 During my half day trip to Mulhouse I got the opportunity to visit one of the most amazing Automobile Museums. No trip is complete without a culinary experience in a wine region and we went to a traditional Alsace restaurant Les Caves du Vieux couvent, serving local specials such as the Canard or duck with lentils which was cooked to perfection. After a sumptuous meal with some fine Alsace wine, we walked a few hundred metres from the restaurant in the direction of the Tour De l’Europe OR the European Tower which is a modern symbol of the city of Mulhouse. This building which is mainly residential is located in the centre and its triangular shape symbolises Mulhouse as the regional junction of 3 European countries – Germany, France and Switzerland. 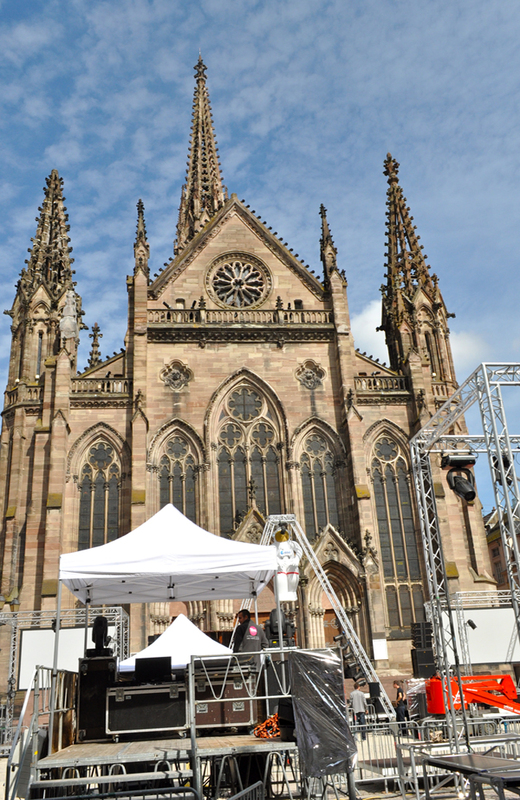 Incidentally, this is the tallest building in the Alsace region of France. 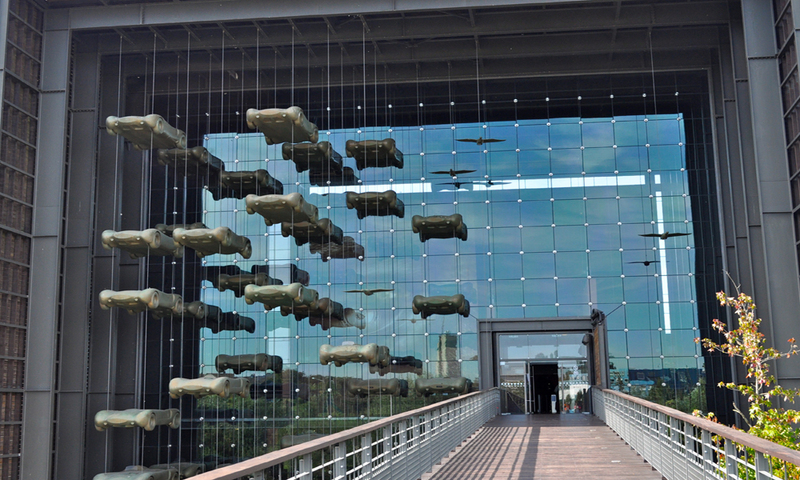 The building comprises of 37 levels and the top floor is a revolving restaurant. On a clear day you can see the Vosges, the plains of Alsace, the Black Forest, The Jura, the Sundgau and the Alps. 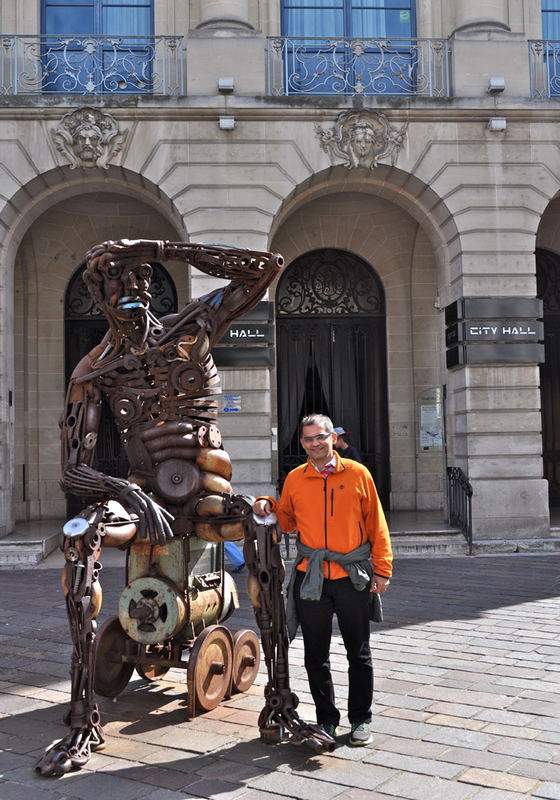 Right in front of the European tower is a very interesting structure known as Le Soudeur, the Welder, inspired by the 1905 sculpture, Schweissdissi, the man sweating by F. Behr in Parc Tivoli, Mulhouse and constructed by Yves Carrey in 2006 with a height of 2.5 metres, just over 8 feet . 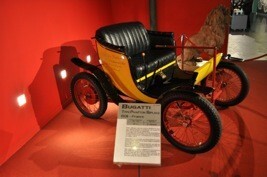 As I had just a couple of hours in Mulhouse before returning to Basel ,I had several options, none better than visiting the largest car museum in the world – Yes, you heard it right, Cite de l’Automobile in Mulhouse has over 400 different models by Bugatti, Peugeot, Rolls Royce and other European branded cars across decades spread over an area of 17000 square metres. 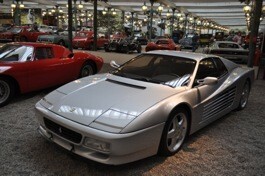 The museum is housed in a former woollen mill which was bought by the Schlumpf brothers in 1957 and later transformed into one of the most beautiful collection of cars in the world. Fritz Schlumpf , the younger of the 2 Schlumpf brothers began buying vintage cars after taking part in numerous rallies since 1939 with his Bugatti 35B. 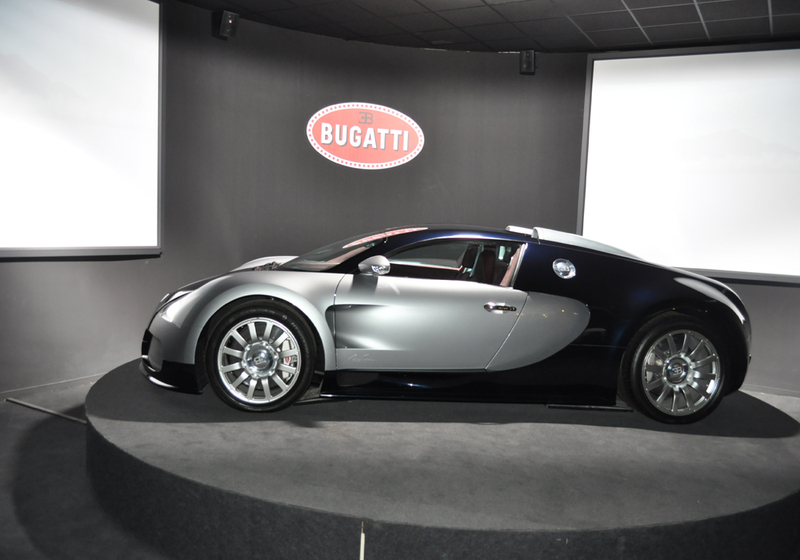 In collaboration with Antoine Raffaelli, a Renault dealer who happened to own several Bugattis and eventually became Schlumpf’s purchasing advisor, he expanded his collection to almost 200 cars by 1963. 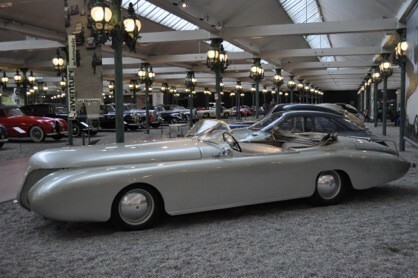 Later in 1966, he started preparing his collection of cars and during the textile crisis, the Schlumpf brothers fled to Basel never to return to France again and after several years of litigation, the court authorised the sale of the collection of cars in 1980. 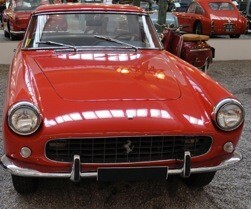 The entire collection was bought by the National Motor Museum Owner’s Association that eventually opened the museum to the public in 1980. 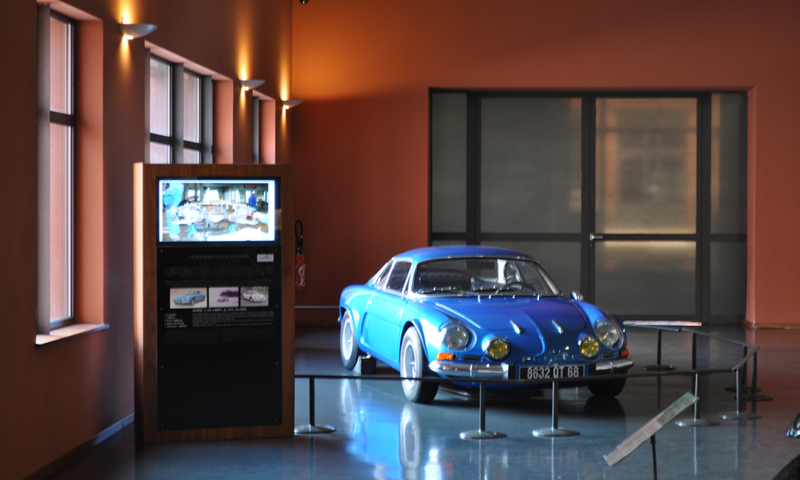 In 2006, Culturespaces inaugurated the New Spaces which expanded the base of this collection and in 2007 the enlarged, modernised and expended National Museum was called the Cite de L’Automobile. 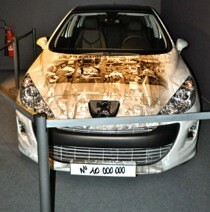 The Motor Car Experience is lit by 800 street lamps , identical to the Alexandre III bridge in Paris and the collection is on display according to the main periods of the motor car. 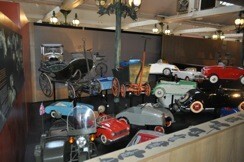 The first group of “Forerunners and Pioneers’ covers cars of Panhard, Peugeot, De Dion and Benz from a period of 1895 to 1918. The second group of Classic Cars marks the 2nd phase from 1918 to 1938 and symbolises the merger of 2 big names of motor manufacturing – Mercedes and Benz. The introduction of the front wheel drive by Citroen in 1934 was the major technical innovation of this period. 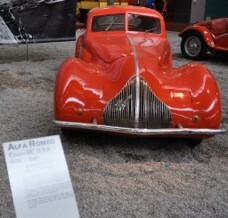 The third group is of Modern cars marking the period after 1945. 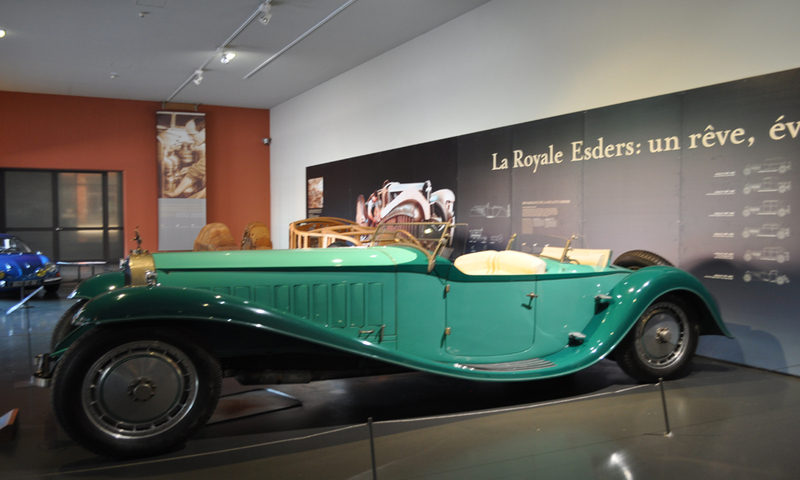 There are outstanding sports models too such as the Panhard – Levassor , two seater of 1908, the Mercedes W125 of 1937, the Maserati 250F of 1957 to name a few. The Central avenue of the museum showcases the most beautiful starting line-up of Grand Prix circuit cars including the famous Bugatti type 32 from 1923. The 1924 Rolls Royce Silver Ghost of 1924 which once belonged to Charlie Chaplin and the Isotta- Fraschini Model 8A occupy a special place in the museum. 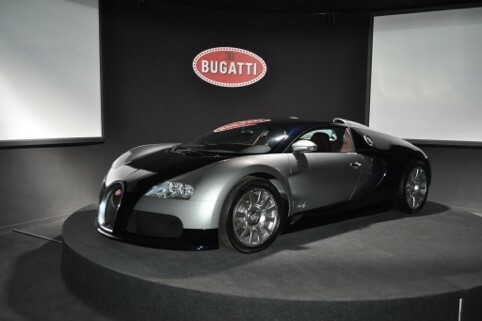 The central position is reserved for the wondrous Bugatti Royales. There is also the Jammet Collection of 101 children’s cars which is truly exceptional as well as the Mascots’ Collection of figurines that adorn radiator caps. 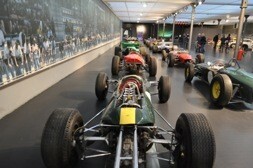 There is the discovery area which is segregated as vehicle restoration area, the life of a car collection and the engine hall and there is an exhibition track that can seat 4500 people on its terraces. 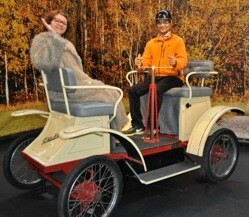 For those who are curious to know about cars of different era, a day would suffice and for lovers of automobile, you would love to spend at least a couple of days at the largest car museum in the world. It was time to bid adieu to Cite Automobile and Mulhouse and head back to Basel and the half day that I spent in Mulhouse gave me a glimpse of this amazing city. 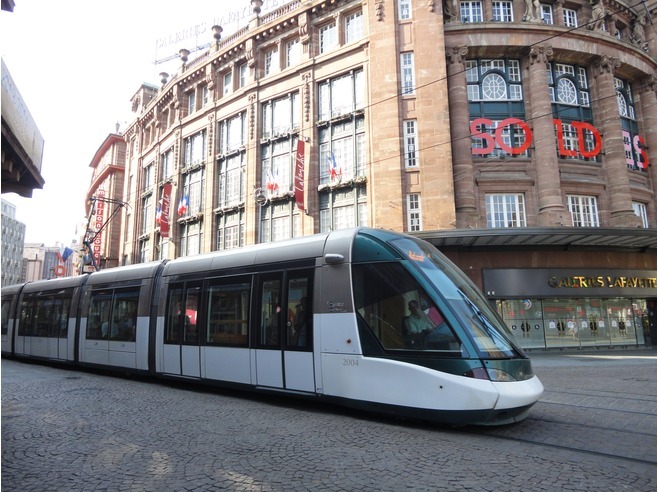 I will be keen to come back to Mulhouse once again to explore more of this wonderful Alsace city as well spend some more time at the Automobile Museum. After having lunch in Mulhouse, France and getting a flavour of this wonderful city in the Alsace region, I was back in Basel the same evening. The proximity of the two cities allow you to stay either in Switzerland and explore France or vice versa.